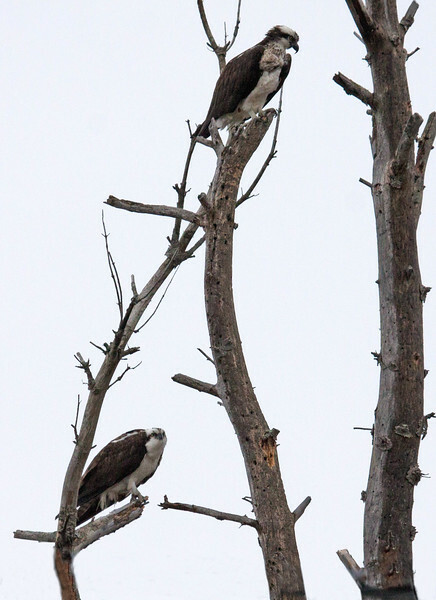 This is a mated Osprey pair. The male is on the lower left branch, the female on the upper right. This illustrates (hopefully) that the female is slightly larger than the male and also the difference in plumage. The female has a marked breast, where the male has a plain white breast. The female looks as if she is wearing a dirty apron. That is how I remember which is which.. Pandion haliaetus, Osprey, also called a Fish Hawk, is a migratory raptor in Maine. For more on Cecropia moths' development and life cycle visit http://www.wormspit.com/cecropia.htm. Pandion haliaetus, Osprey are migratory, fish eating raptors in Maine.